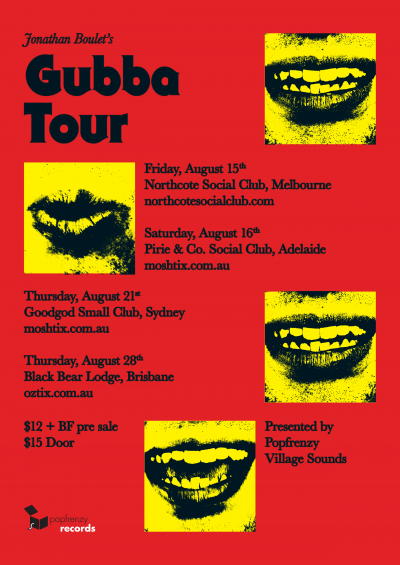 Goodgod is stoked to host the awaited return of Jonathan Boulet, after a year spent abroad. After a UK/EU tour and performances at SXSW last year, Boulet relocated from Sydney to Germany, sans band and sans plan. His “Berlin Era” was not crack-fuelled like so many others’. Rather, the Australian expat successfully managed to immolate past notions of his music amidst the right-proper snowstorms of a European winter. Without crack. He’ll be playing material from his new, harder, noisier, faster, and self-produced record Gubba.